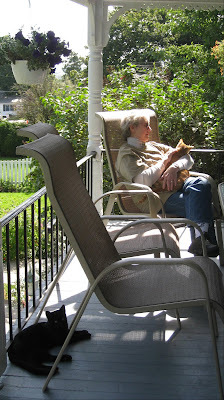 I was talking to my Mom on the phone one sunny afternoon in May while sitting on the back porch. I noticed some movement in the shrubs by the Carriage House. Kittens were jumping up and down inside the bushes. I could see their heads appear on top of the bush, next there was a tail in the air! I watched as they made their way to our backyard, jumping and running and doing all the cute things that kittens do. The weeks went by and the kittens were around more and more. 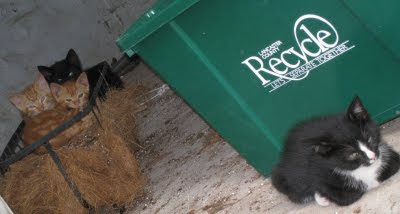 They were so tiny and Mom was still nursing – but all were very skittish and (I assumed) feral. And so, being the cat lover that I am, and knowing that the odds of these kittens leading a full life was very low, we set out some boxes with towels for beds and fresh water and food. But they liked the coconut mat and windowbox under the porch. We knew that their only chance for ever being adopted was to trust people. 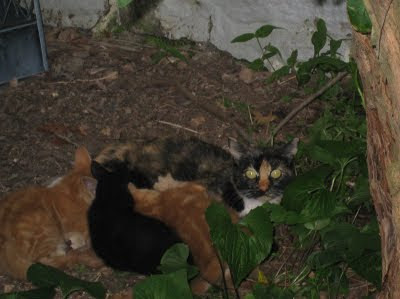 All of our four cats were strays. 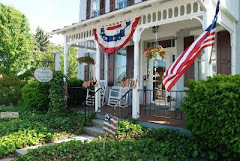 Unfortunately, we live a small “apartment” inside The Artist's Inn. Outdoor cats have an average lifespan of four years, but indoors, that average soars to 14 years. I don’t know when we started to name them, but they were simple names used to tell the difference in them: Big Red, Little Red, Tuxedo Man, The Man in Black, Mom. They would entertain us at night as we ate dinner on the back porch. They chased after fireflies, climbed the tree (and go down backwards! ), jumped on each other, rolled and played, ran and jumped into the air – all under the ever-present watchful eye of Mom. And a mom she was – quite good actually – cleaning her kittens, and being so patient as they landed on her head and pulled at her tail – not unlike small children waking up their parents in the morning in bed. Guests delighted in seeing them in the early morning and cat lovers would often try to pet them. 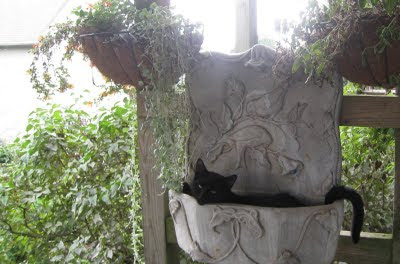 That is why my flowers were a bit trampled and thinner this year, why we didn’t put fresh water in the bird bath (lest the birds become dinner) and why there was usually a towel on the Adirondack chairs to cushion their nap. And so the process of socializing the felines started. Our cats loaned us a toy they hardly ever used. It was a stick with a rawhide string attached, and, at the end, a white lambswool “mouse”. It was a hit from the time it appeared on the porch. And so I would spend as many evenings as I could trying to tame the kittens…starting with letting them “catch” the mouse, then having the mouse “touch” their bodies, then having the stick scratch their head or tail, and finally getting them to be brave enough to have a human hand touch them. Tux was the bravest. We scooped him up and held him in our palm – and once he felt the warmth of Bruce’s hands, there was no turning back. Every time we went out to the back, he was there looking for attention. 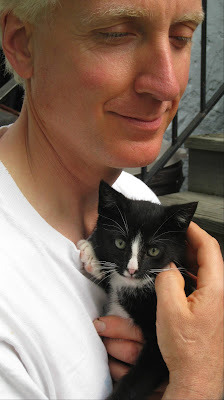 As so the Friis, who came to bike and visit, went home with our little Mr. Tuxedo Man (although it took quite a while to wake him from his nap under the boxwoods). They wanted Little Red as well, but she was just not tame enough to come to them – even though Tuxedo Man was her best buddy. And so Little Red was left behind. 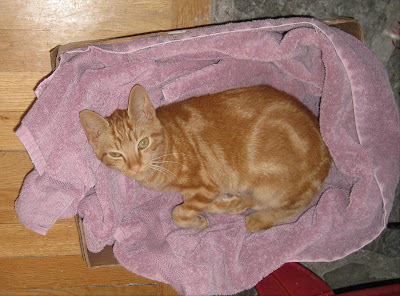 The report came back from the Friis’s vet – no feline leukemia, no fleas, no ear mites, no diseases of any kind. He was in great shape and ready to take over the household. With that successful adoption, we were inspired to move on to the other kitties. I started to put out milk on the porch twice a day, and call the kitties by name. Their little heads would appear and even Mom enjoyed the treat. Little Red was the next to be petted. It happened one sunny Sunday afternoon. 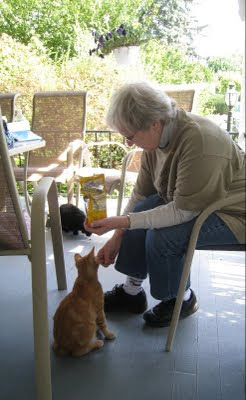 Bruce lay down on the porch and she and Big Red went all around smelling his hair and nose – and eating the treats that we tossed to them. 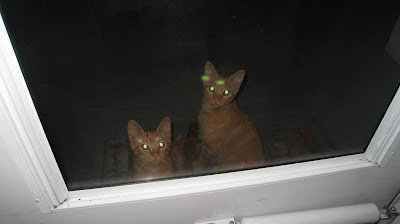 They would visit our porch parties regularly, as if patrolling and checking on us, but were still pretty aloof. As the weeks went by we were able to feed them all treats. Big Red was probably the most affectionate. I got to hold him like a baby and he would stand by the porch door on his back legs, looking in at Chardonnay. Did they know they looked alike? 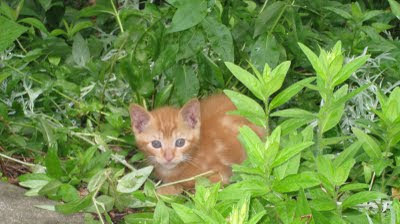 He would stand in my windowboxes and meow and Jack would come over and they would smell each other through the screen. And they were both talkers. What they had to say to each other remains a mystery to me, but it sure seemed like they had a lot to talk about. Mom was not spending as much time around our yard, and the kittens were now answering my calls more than hers. 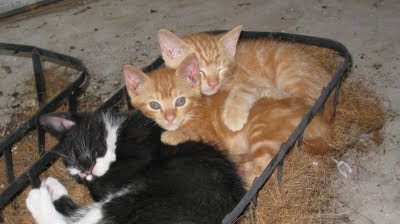 Our goal was to get them all spayed and neutered and adopted out to homes. Progress was slow and when Bruce’s cousin stayed for a visit, he was able to catch Little Red by the scruff of her neck. But as she was held in the air screaming, I just didn’t have the heart to trap her and I made him release her. It was my hope that I would win her over my way – with gentle persuasion so that she would learn to trust people. And so he let her go. One day as I was driving down Main Street, I felt a terrible thud and my front tires went over a bump, and, in what seemed like slow motion, the back tires went over a bump too…..dreading what I would see in the rear-view mirror, I caught a glimpse of the tiny little mottled kitten (yes, there was a fifth) pulling his injured body off the road. By the time I went back he had gone somewhere alone to die. I felt awful and still do. As I parked the car at home, I saw Mom on the back ledge by the gardens. She seemed to know and I explained how sorry I was. Did those big eyes understand? Was that why she was waiting for me and didn’t run? Can they tell by the tone in your voice? I was now more determined than ever to get these kittens off the streets and into homes. While Big Red and Man in Black would stick fairly close by (and I knew their sleeping places) Little Red was spending a bit more time away. Her favorite spot to snooze was on the back steps from the Garden Suite. Although the spot was sunny, there were several times when she was in the way of guests going down the back stairs, and fell from the steps into the lilac bush. I started to get concerned because she wouldn’t always answer my calls. One busy Saturday she appeared for milk and her tail was huge. She seemed to be dragging it behind her. I called my vet and, although they couldn’t look at her that day, I arranged to have her boarded – she would be safe and they would evaluate her on Monday. And so the kitty that I had never picked up, got scooted into the dining room while I ran for the carrier in the basement. I’m not sure who was more scared, but on the fifth try and wearing my biggest oven gloves, I managed to get her into the carrier and off we went to the vet. Man in Black and Big Red looked on as she was hurried past them crying all the way. That Monday we learned what we had feared – she had to have her tail amputated – apparently she had gotten it caught in something and had pulled so hard to free herself that she had damaged the nerves in her back end. We had her spayed since she was undergoing surgery anyway and we were scheduled to pick her up on Wednesday. I was busy with guests, and Bruce was away when the vet called. The surgery had gone fine and Little Red was recovering but there was a chance that the nerves would not regenerate and she would be somewhat incontinent. She was making it to the litter box in her little cage but, he warned, in a house, she may not always have the time to get there. We hoped and prayed and waited for her return. 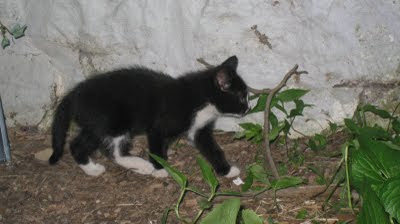 She was the runt of the litter and seemed even tinier than before, with just a stub of her tail left. So inside she came--and adapted as though she owned the place. At first she hid under the couch to sleep, but as she became more comfortable, she took up more and more space on the couch – stretching out her toes, leaning her head against the arm, and once fell asleep with her head in the food bowl! She took her antibiotics like a trooper, and learned to jump on the back of my chair and onto my lap. She immediately took control of all the toys, especially the one with the merry-go-round ball. She would paw at my leg and squeak for attention. She ate everyone’s food, watched as the printer pumped out papers and was patient as I prepared breakfasts. As she regained her strength, she and Jack would run and jump and climb all over each other and even paw at each other under the closed door. Often I would get up in the middle of the night – just to check on her – she would be laying on the floor just outside our bedroom door, wanting to be with us. But it was a rough go from the start. Little Red, try as she might, just had no idea sometimes when she was urinating. Most poops would be caught, but there were those that she missed and would try to clean up by pawing imaginary litter across the floor. A bleach bottle in my left hand, paper towels in my right, I would inspect the floors all hours of the day. We restricted Little Red mostly to our family room and covered the couch with piles of towels – which I laundered twice a day. And we hoped and prayed that she would regenerate her nerves. We researched the condition and talked with vets – all saying the same thing – this is a serious condition and one that may get worse. It was about this time that the Woolleys came to visit. 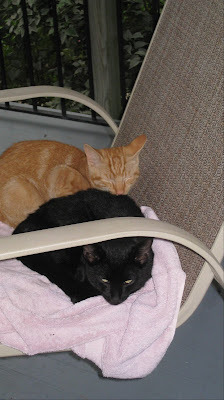 Big Red and Man in Black had now abandoned their little beds down below and were sleeping every night and afternoon on our side porch. Paws landed on each other’s head, rested in their ears, tails and legs intertwined, they didn’t mind and the two were inseparable. I found myself going out to love them a lot during the day, and they seemed grateful for the visit (or was it the treats?!). I could now carry Big Red around like a baby. I looked for them every night before I went to bed, tucked them in and greeted them before I set the table for breakfast. If the window was open and they saw me, they were quite vocal about getting their morning milk. 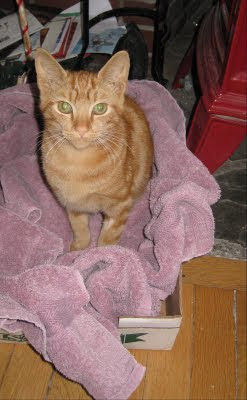 Big Red charmed his way into the hearts of the Woolleys (guests at the inn) and they offered him a home. 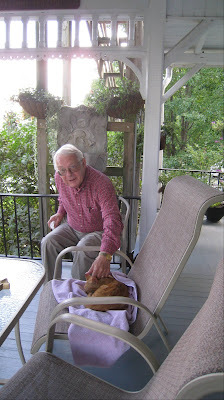 As he was in the carrier on the porch, Man in Black came over and pawed at Big Red as if to say goodbye. And mom must have heard the cries, because she appeared on the porch as well. We hadn’t seen her in days. Is there more communication going on with these kitties than we know? It was so sad to see him go and see Man in Black left all alone. That is when Man in Black started to cry – every time I went onto the porch, he cried. Was he crying for the loss of his brother, Big Red? Was he crying because everyone else was gone and only he was left? It seemed like he was spending all his time on the porch. At night he would stand on the windowbox and cry to come in. Bruce’s mom had agreed to take him – if only we could get him tame enough. The clock was ticking. He had been eating treats out of my hand, and now became very brave and let me pet him, but would run if I tried to pick him up. These cats surely tried to teach me patience. The day came when Little Red got her stitches out and Bruce put her outside to reacquaint her with Man in Black. (We had planned to take them to Priscilla’s farm, where they could look out for each other.) They played like crazy all day, running around the house, up and across the porch, into the yard to chase after butterflies, hardly stopping to eat. That night I kept looking on the porch for Man in Black. I had hoped that he and Little Red would sleep together – just as he had with Big Red. But there was no sign of either of them. My last guests arrived late that night, and as I was turning out the lights, a black form on the sidewalk across the street caught my eye. Man in Black must have been hit by a car and dragged himself to the sidewalk. I stood there and cried – just that day I had been able to rub his belly, and he rewarded me with kissing each finger. I had looked up and Mom was in the corner of the porch, witnessing the little miracle. But all the lessons had been in vain, for I had failed to find him a safe home fast enough to get him away from the danger of living outside. How sad to end this little life of 6 months – Man in Black was probably the most loving with his siblings – he was always grooming one of them, and I’m convinced, if given the chance, he would have been a very loving and handsome addition to any family. As I stood there with just the moon lighting the way, my mind raced to Little Red and I starting calling earnestly for her. I had to find her and get her inside again. I did find her, running wildly next to Main Street, clearly saddened by her brother’s passing as she ran back and forth to him. And so she came inside again and I cuddled and comforted her cries. She had been through a lot in 6 months – getting her tail caught in some horrible terror, going to the vet with strange cats and dogs and noises and smells, losing her tail, and now witnessing her brother getting hit. Was she with him when it happened or did she find him after? Did she narrowly escape the same end? I was glad when the rain came on Sunday to wash away the blood left on the sidewalk from Man in Black. We researched cauda equina syndrome; and learned about lower motor neuron bladder, we cleaned up after Little Red and hoped for a miracle and the nerves to regenerate. Although there was great improvement on one day, the next day would bring bad news again. Both Bruce and I had grown to love this little fighter and would gladly give her a loving home – if only she could control herself. Bruce was at a show talking to a customer when he learned about The Best Little Cat House in PA – a no-kill shelter for cats that have no other hope. He called and found out information and Lynn seemed to know a lot about Little Red’s condition – in fact, they had a cat with the same problem. Could this be the answer? A date was set – unfortunately it was a Saturday. I cancelled my trip to see family, cancelled the innsitter and rearranged my schedule on a busy Saturday to drive to the facility and see if Little Red would like it. I cried two days before, the whole time there, and since. I packed her favorite merry-go-round toy and, of course, the mouse, loaded her into a carrier and set it in the front seat. She is so tiny that she didn’t weigh enough (even with the carrier) to set off the seat belt alarm. Did she know where we were going? I had told her and she looked at me the whole way there – past Hershey, past the two dead cats on the road, past the places where I turned around because I couldn’t concentrate on the directions. It is a wonderful place – full of things that little furry ones like – lots of windows, a place to go outside (safely), plenty of food, places to investigate and other kitties. But, I had never been to a shelter before and I was not prepared for what I saw. A cat with one eye, a kitty born paralyzed with his feet turned the wrong way, cats with brain and kidney tumors. 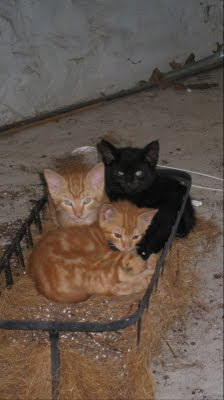 Cats were craving affection, especially the ones in the “other” room – where they separated the leukemia and AIDS cats. My heart ached for them. How could I leave my perfect kitty here – would she contract the upper respiratory infection that the little grey cat had? Would she have anyone who could play with her? Would she have anyone to cuddle at night when she cried? Would they notice if her condition got worse? Would she live a long life? The answers to my questions were mixed – they have a staff of volunteers, but never enough. The kitties have no rules and can come and go outside whenever they want - something that we could never give her. Once you leave a cat you cannot ever visit it again (thank you insurance companies) and once you leave it, you leave it like an unwanted pile of clothes at Goodwill – she belongs to them and you cannot, under any circumstances, have her back (thank you to the lawyers of the world). All of these things weighed heavily on my mind. My cell phone wouldn’t work at this remote location so there was no talking with Bruce. His words rang in my head: This may be Little Red’s only hope for a happy home”. 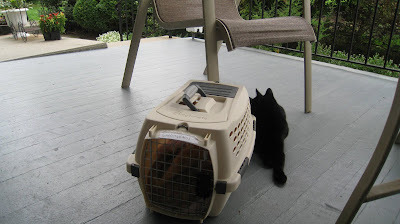 I watched as she lay still in her carrier – eyes wide as two other cats climbed on top. And so I tried to make my decision, and in the end I left her. As Charles Dickens said, "There is a wisdom of the head, and a wisdom of the heart." Unfortunately, we had to choose the wisdom of the head this time. But our hearts will ache for quite some time. Little Red will probably adapt – she’s a fighter and will have other cats to play with, will be fed and kept safe and warm. There are very good people at this shelter and she will meet cats from all over the world. Her basic needs will be met, but the cuddling and comfort that a family pet receives is gone and she will have to adjust. We miss her terribly. How I wish I could take back the day that she got in trouble. How I wish I could have worked more quickly on taming these cats and finding them homes. How I wish I had just taken them in where they would have been safe -(even though we were at our limit with two and now have four cats). How I wish I had a place big enough where Little Red could be isolated and cared for by us, but we do not have that luxury. So, what have I learned from all this? That you may not always have the time to love something, so you’d better love it with all your heart and soul. That everything in the world needs love and that we all need to take care of someone. That we never know when our time is up and that it’s important to remember the good times. That it’s important to take pictures – I have only a few of all those happy times. And that cats live in the moment – and there’s a wisdom to that. The porch is now quiet and soon winter will set in. All that there is left to do is to somehow trap Mom and get her spayed so that she will not be bringing more litters to the neighborhood. Poor Mom has seen her babies leave one by one. If she’ll let us, we’ll provide warm towels and food and water and her basic needs will be met as well. And so ends this tale of two kitties – two kitties that beat the odds and ended up in loving homes with furry friends. If you would like to help, consider volunteering at a local shelter – cats and dogs need to be loved, walked and groomed. Consider donating food, gift cards from PetSmart, or money. Have your cats and dogs spayed and neutered. Not only does it cut down on the explosive growth in population, but it helps lower the spread of disease. Keep them inside and give them lots of love.